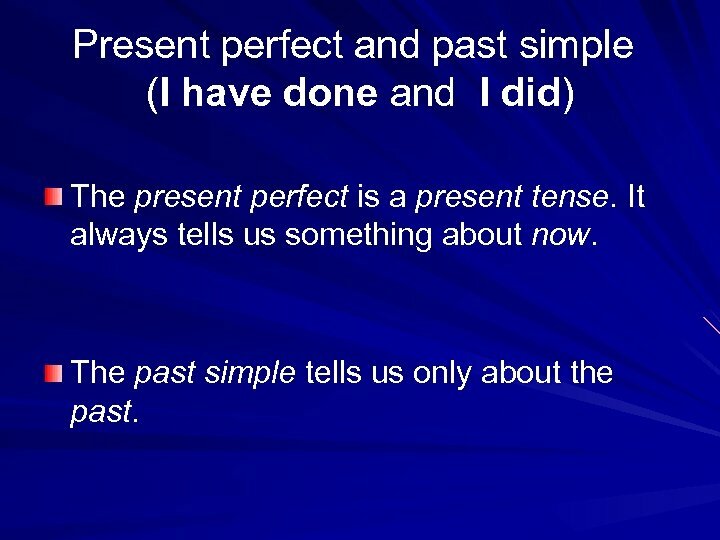 Present perfect and past simple (I have done and I did) The present perfect is a present tense. It always tells us something about now. The past simple tells us only about the past. 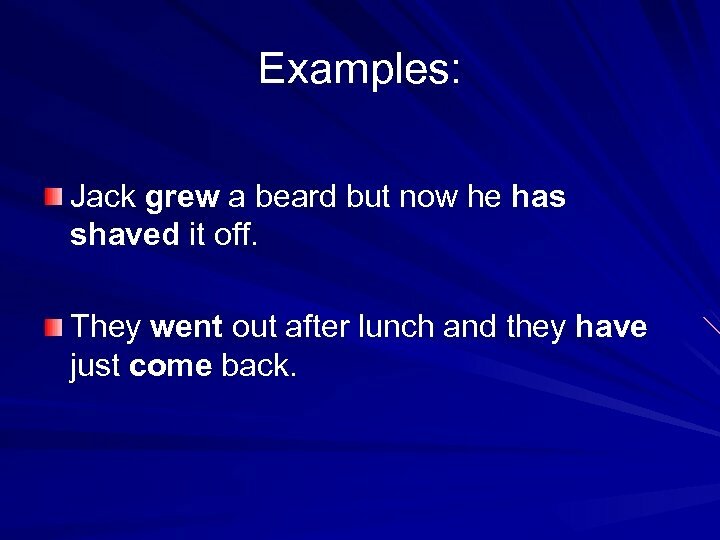 Examples: Jack grew a beard but now he has shaved it off. They went out after lunch and they have just come back. 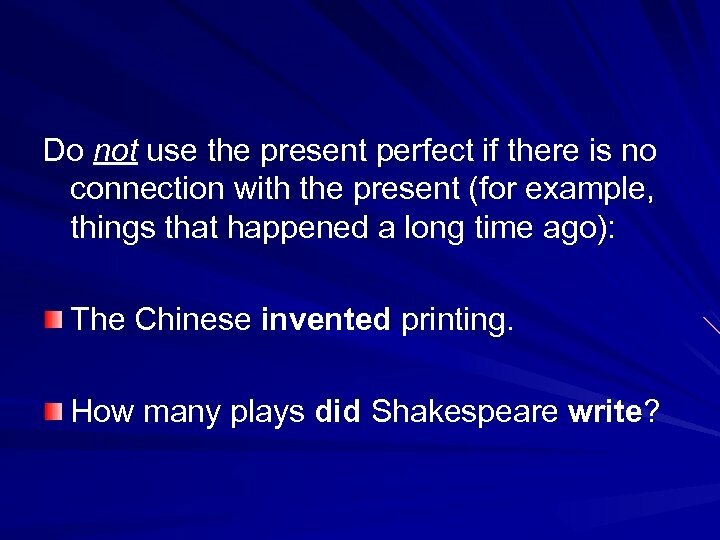 Do not use the present perfect if there is no connection with the present (for example, things that happened a long time ago): The Chinese invented printing. How many plays did Shakespeare write? 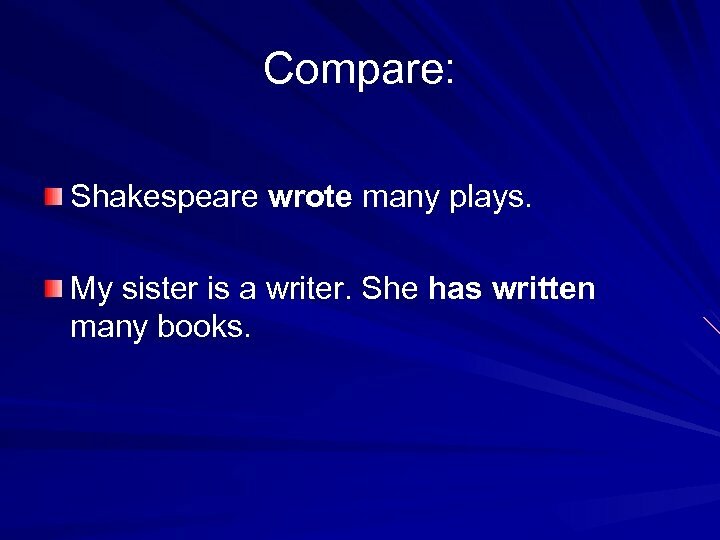 Compare: Shakespeare wrote many plays. My sister is a writer. She has written many books. 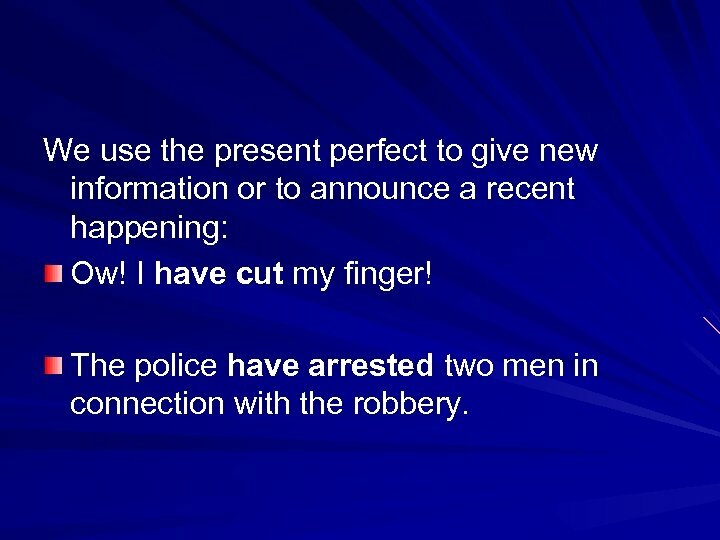 We use the present perfect to give new information or to announce a recent happening: Ow! I have cut my finger! The police have arrested two men in connection with the robbery. 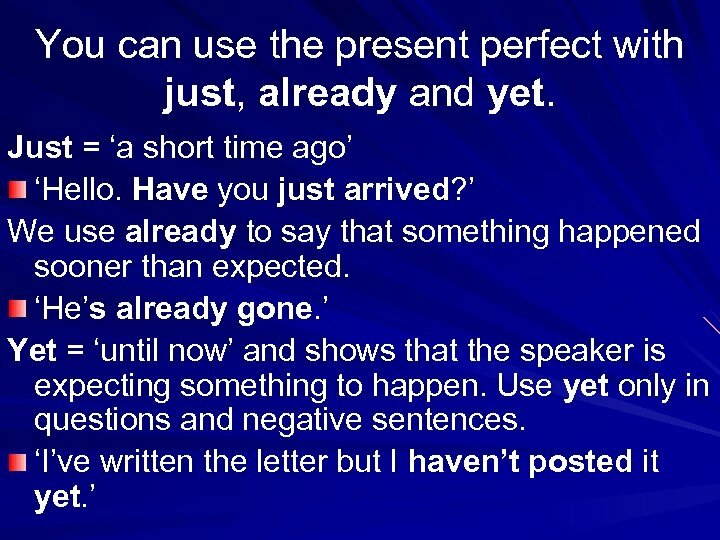 Do not use the present perfect when you talk about a finished time (for example, yesterday / in 1985 / ten minutes ago). Use a past tense: I went to bed early last night. They arrived an hour ago. 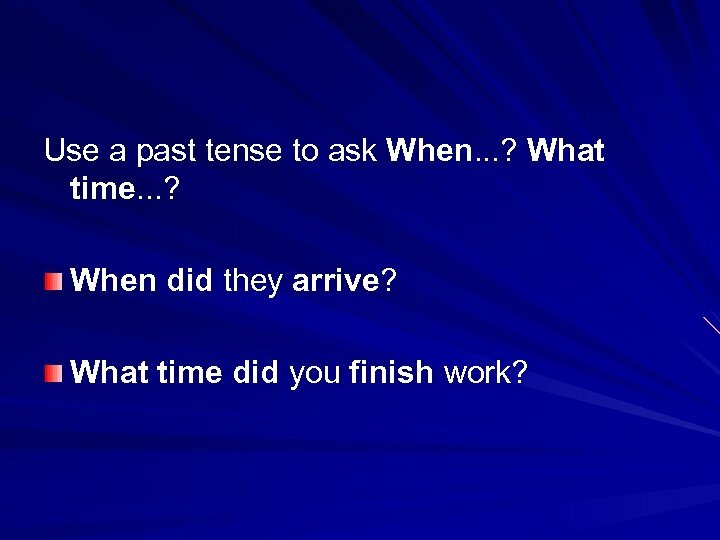 Use a past tense to ask When. . . ? What time. . . ? When did they arrive? What time did you finish work? 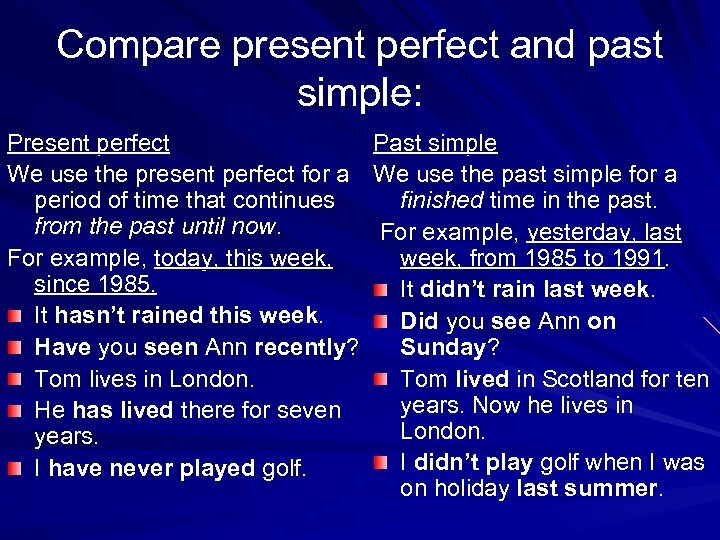 Compare present perfect and past simple: Present perfect We use the present perfect for a period of time that continues from the past until now. For example, today, this week, since 1985. It hasn’t rained this week. Have you seen Ann recently? Tom lives in London. He has lived there for seven years. I have never played golf. 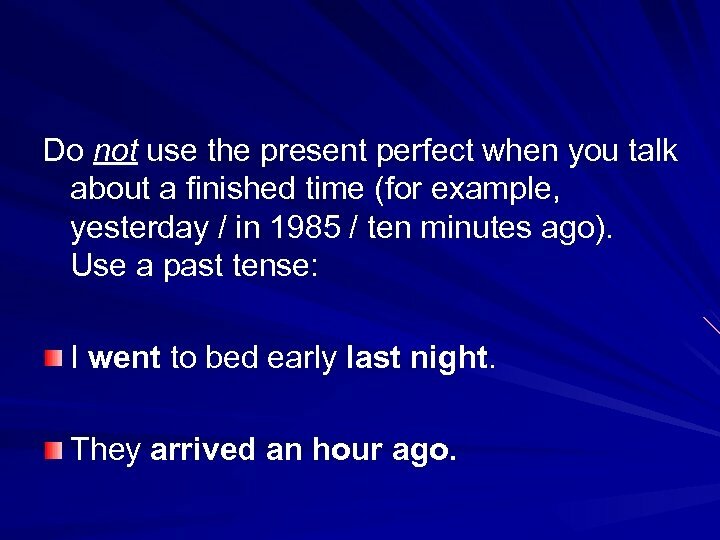 Past simple We use the past simple for a finished time in the past. For example, yesterday, last week, from 1985 to 1991. It didn’t rain last week. Did you see Ann on Sunday? Tom lived in Scotland for ten years. Now he lives in London. I didn’t play golf when I was on holiday last summer. 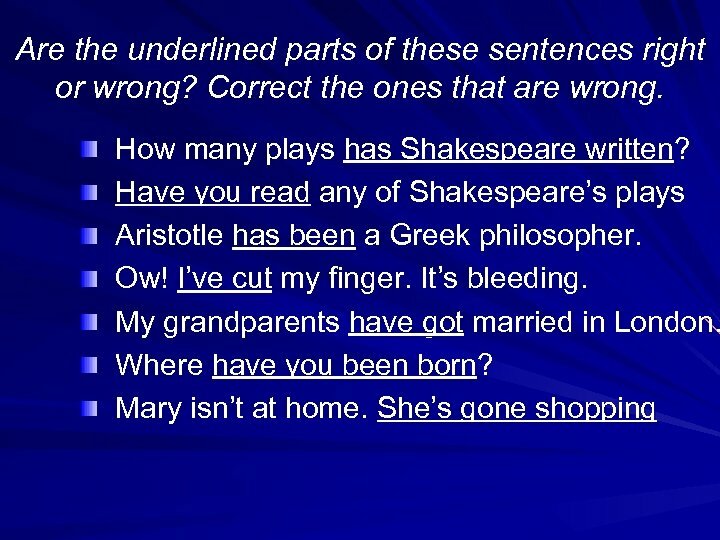 Are the underlined parts of these sentences right or wrong? 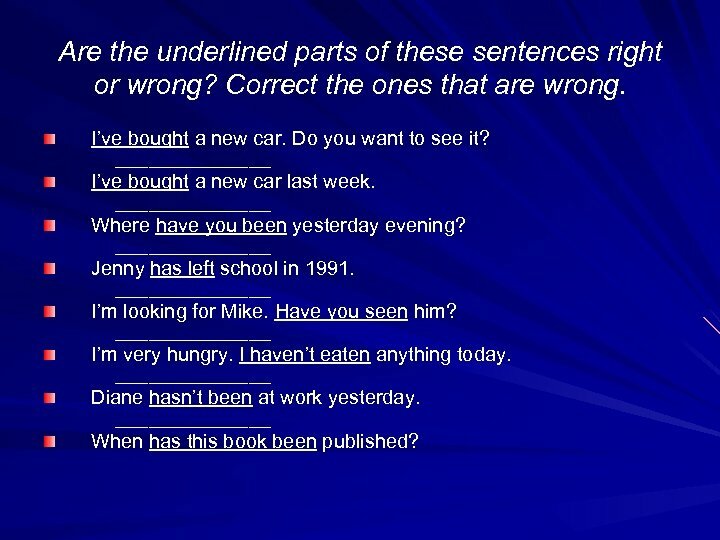 Correct the ones that are wrong. I’ve bought a new car. Do you want to see it? _______ I’ve bought a new car last week. _______ Where have you been yesterday evening? _______ Jenny has left school in 1991. _______ I’m looking for Mike. Have you seen him? _______ I’m very hungry. I haven’t eaten anything today. _______ Diane hasn’t been at work yesterday. _______ When has this book been published? 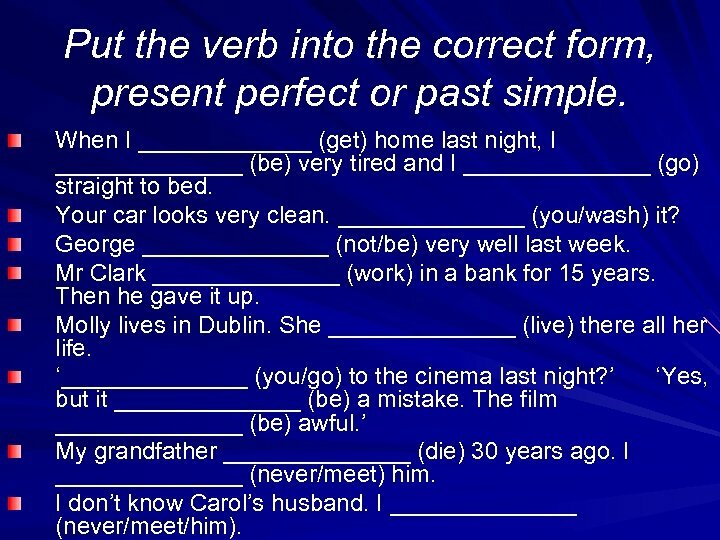 Put the verb into the correct form, present perfect or past simple. When I _______ (get) home last night, I _______ (be) very tired and I _______ (go) straight to bed. Your car looks very clean. _______ (you/wash) it? George _______ (not/be) very well last week. Mr Clark _______ (work) in a bank for 15 years. Then he gave it up. Molly lives in Dublin. She _______ (live) there all her life. ‘_______ (you/go) to the cinema last night? ’ ‘Yes, but it _______ (be) a mistake. The film _______ (be) awful. ’ My grandfather _______ (die) 30 years ago. I _______ (never/meet) him. I don’t know Carol’s husband. I _______ (never/meet/him). A: Is your father at home? B: No, I’m afraid he _______ (go) out. A: When exactly _______ (he/go) out? B: About ten minutes ago. A: Where do you live? B: In Boston. A: How long _______ (you/live) there? B: Five years. 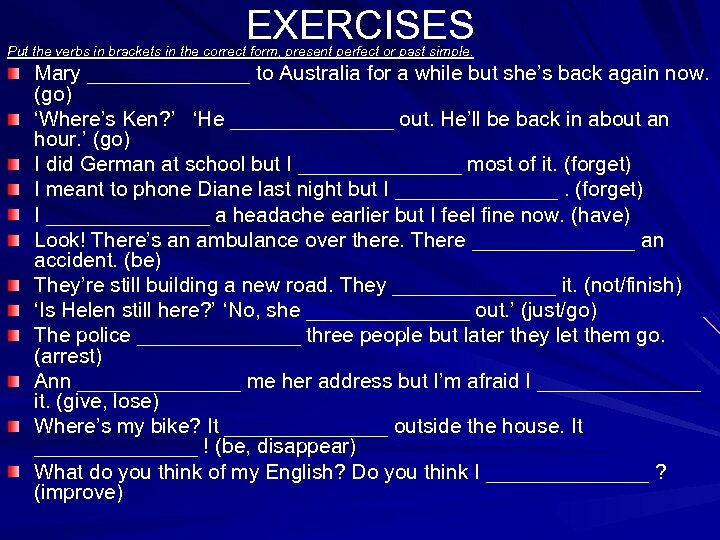 A: Where _______ (you/live) before that? B: In Chicago. 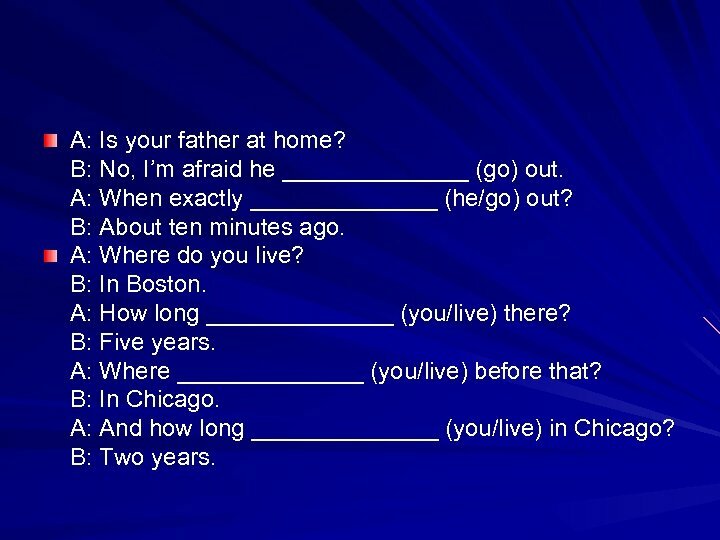 A: And how long _______ (you/live) in Chicago? B: Two years.